Science tells us that babies begin to remember and sock away images in their memories from their first day, with Mom or the caretaker being one of the first to become familiar--baby's first chance to build a categories of remembrances. 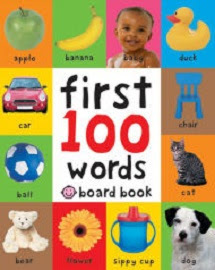 In the new board book edition of his First 100 Words (St. Martin's Press, 2016) Roger Priddy offers twelve categories of things that babies encounter in their first year--Colors, Things That Go, Bathtime, Bedtime, Mealtime, Food, Myself, Outside, Clothes, Toys, Pets, and Farm Animals. In this substantial board book, colored and carefully edited photos of each category share a double- page spread. For example, the two-page spread on Food has both broccoli and bananas, while Clothes offers items from socks to sweatshirts. Pets includes pups and parrots, and Bathtime features both rubber ducky and bathtub. Things that Go shows both tractors and trains, and Myself catches babies crawling and crying, and all the other things little ones do. This one also deserves some time beyond babyhood on the preschool shelf, because, with each item labeled in bold lower-case letters, this book also functions as a photo glossary of common words that can be recycled for emergent and beginning readers. Inexpensive and very sturdy, this one is a real bargain for babies and baby's first teachers. Bruce had been a contentedly curmudgeon bachelor bear, until inadvertently a hatch of goslings (at that impressionable age) imprint on him, forcing him to become "Mother Bruce." Raising goslings requires annual migrations southward when Bruce's predilection is to hibernate, but the dour bear does his duty for his brood. But returning to his beloved den after wintering over at Miami Beach, he finds his home appropriated by a batch of squatter mice who have turned his quaint cave into The North Woods Hotel. His almost-grown goslings cheerfully become bellhops, but Bruce is not a happy camper in his own home. Morning finds a frog in Bruce's toilet and an aproned Chef Fox in the kitchen, trying to coax the turtles into a steaming tureen as the soup course for dinner. And then the tour bus full of elephants (and their trunks) arrives, and they all have reservations! His little liveried goslings rush out to take their luggage. With a ROAR Bruce clears the place, with the interloping critters running for the tall timber, followed by the would-be hotelier mice, Peace and quiet reign inside as rain begins to pour outside. Bruce's goslings softly honk sadly as they watch the mice getting soaked as they seek shelter under an evergreen. Will "Mother" Bruce relent? The goslings already know that crabby Bruce is an old softie, in Ryan T. Higgins' Hotel Bruce (Hyperion Books, 2016). 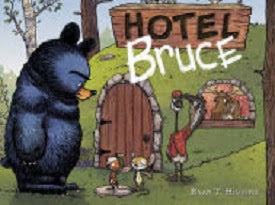 In this sequel to his hit, Mother Bruce, Higgins brings back his bad-tempered bear in another picture book filled with illustrations loaded with sight gags and the sweet silliness of a grumpy bear who finds his den as full as the old woman who lived in a shoe. "A merry, witty celebration of chaos and grumpiness," rejoices Kirkus Reviews. IT'S A VERY BIG DAY ON THE FARM. Mice floating past the windows? Yes, actually. It seems the mice have been assigned the task of decorating with the helium balloons for what looks to be a birthday party, and they've gotten, er, carried away with the job. Signs are posted, with strange disclaimers from "neigh"-saying deniers added in bold marker. But with the mice rounded up and the balloons tied down, it's time for the party guests to get all gussied up for the occasion. Farmer Brown wears his brand-new straw hat. All the yellow ducks take a long bubble bath. A party novice, Little Duck watches and follows the lead, rub-a-dubbing in the tub, too. The sheep go for a shearing, and Little Duck gets his topknot clipped, too. Cat gives her fur a lick, and Duck does a lick, too. The chickens take a dust bath, shimmy-shaking their tail feathers, and Little Duck shakes his tail, too. The pigs choose a mud bath, and Little Duck joins in a squishy and squashy session. Then they all walk to the party under the maple tree, where Farmer Brown is lighting the candles on his cake. But the host and party guests are the ones are the ones to get a surprise, when the guest of honor shows up, drippy, damp with duck spit, muddy, dusty, and totally disheveled just as the gang is ready to sing Happy Birthday, Dear Little Duckie! It's a surprise, all right, in Doreen Cronin's eleventh book in her best-selling series, Click, Clack, Surprise! (Atheneum Books, 2016). 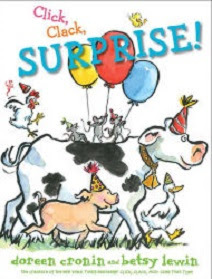 Artist Betsy Lewin carries most of the load in this continuing collaborative surprise party tale, with her humorous illustrations fleshing out this simple down-on-the farm story with clever wit and the familiar comic characters who have delighted youngsters for a couple of decades. Says School Library Journal, "Readers are likely to get caught up in the onomatopoetic fun and may be inspired by Lewin's energetic watercolors to wiggle, shake, and strut along with the animals." Cronin and Lewin's first best-seller together was Click, Clack, Moo: Cows That Type and since that time have turned out many kid-pleasing stories of Farmer Brown and friends (see more reviews here). CAN YOU NAME THE COLORS OF DUNCAN'S CRAYONS? The ace duo of author Drew Daywalt and artist Oliver Jeffers returns, backed by the best-selling status of their first two books, to take their message of the sense, subtlety, and substance of colors down to the basics, in the persons of their droll personifications of Duncan's introductory box of eight. BLUE is in a mood indigo, whining a bit about his workload, worn down to a nub with the job assignment of coloring vast spaces of sky and water. Jeffer's spindly lines and lively personifications, paired with Daywalt's straight-faced but witty prose, make for an intriguing and delightful way to introduce colors to tots with a bit of humor and verve, in their new board book collaboration, The Crayons' Book of Colors (Grosset and Dunlap, 2016), a different look at the life of crayons outside the box. 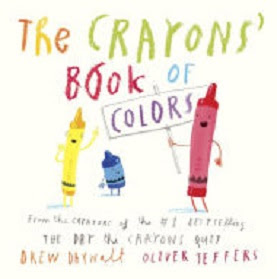 Daywalt's and the Caldecott-winning Jeffers' previous pairings include the picture book hits, The Day the Crayons Quit and The Day the Crayons Came Home. 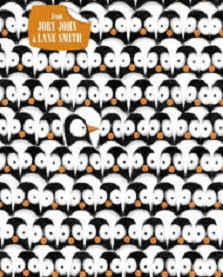 Penguins are a hot property in picture book land, but for one penguin in a perpetually pessimistic mindset, the mood is perennially chilly. My beak is cold. The ocean smells too salty today. It snowed some more last night, and I don't even like snow. And he's getting hungry, which means he has to jump into an icy sea, where the best he can hope for is a cold, soggy fish. And where is a fish when you need one? Pessimistic Penguin takes the plunge. But under the sea is no improvement. It's actually F-R-E-E-Z-I-N-G down there. I sink like a rock. Our despondent penguin finds himself at the end of a veritable food chain of predators--a whale chasing a shark, the shark chasing a leopard seal, and the seal chasing HIM!! Barely escaping back on the barren shore, the depressed penguin begins a major whinge. He looks silly when he waddles. His flippers ache and he can't fly. Everyone looks alike, so he can't even find his family. To prove it, he approaches a parental-looking penguin. "I have absolutely no idea who you are!" Our despairing penguin needs an anti-gloom guru, which he finds in the person of a philosophic walrus, who spouts pearls of wisdom for free, advising him to see the beauty all around him, feel the sunshine on his shoulders and the love of his fellow penguins, and know that he is right where he is supposed to be, blah, blah, blah. "Who the heck was that guy? Walruses don't understand penguin problems! Okay, Okay. Maybe that walrus has a point." Yeah, yeah, yeah, the sky and ocean are a nice blue.... and it's "look-for-the-silver-lining" time down in polar penguin land, in Jory John 's Penguin Problems (Random House, 2016), as our petulant penguin bucks up and determines to try to appreciate his ecological niche--just as his pretty little snowflakes morph into yet another below-zero blizzard. Life's a icy beach for this peevish penguin, but author John's glorious whine about the injustices of polar life could make even a killer whale snicker. Caldecott artist Lane Smith does a dandy job in this repeat study in black and white, with plentiful placement of orange accents and text. For youngsters who've got a good grumble going, this little lesson in black humor will coax a grin out of the the gloomiest grinch. "Well-paced, bursting with humor, and charmingly misanthropic," counsels Kirkus Reviews. Jory John's previously top-selling, giggle-producing, yet pessimistic books include Quit Calling Me a Monster! I Will Chomp You!, the laments of the extinct dino, All My Friends Are Dead and All My Friends Are Still Dead, and for kids a bit old for alphabet books but just right for wry wit, K is for Knifeball: An Alphabet of Terrible Advice. Dad stuck his head around the doorway. "James, you've got an email," he said. "Me?" said my brother James. "Who from?" "Ho ho!" said Dad. "It's a secret admirer!" How do you do? I am your cousin Bella. Granny and Granddad say that you are the same age as me, so I am just writing to say hello. I like theater and dancing. What are your hobbies? Please email me back. James is underwhelmed at having an email from a strange girl, especially one with LOVE in the closing, and wants nothing to do with romantic correspondence. Agatha, however, hopes to meet Cousin Bella's glamorous model/actress mom, Aunt Zoe and decides to do James a sisterly favor and take over, writing Bella back, pretending to be James. Agatha means well and tries to make James sound as boring as possible. I am very boring. I do not like any of the things you like. My only hobby is spelling. Agatha is immediately distracted from James' epistolary love life when her disconsolate friend Martha arrives at the door with bad news. Her mom has grounded her from playing soccer because of yet another torn jersey. Agatha promises to fix the problem, convincing her friend to join the school spelling team to get on her mom's good side. Martha moans that she's a terrible speller, but Agatha fills out and turns in an application for Martha anyway, along with one for her friends Ellie and Bianca. And when their arch nemesis Gwendoline Tutt brags that she is going to rule the spelling team, Agatha and friends determine that somehow they must foil her selfish plan. But Martha is going to need a LOT of help. And then good fortune arrives--in the form of an email reply from Cousin Bella. THANK YOU FOR YOUR MESSAGE! Spelling is my favorite thing, too!!!! I am on the school spelling team. Today I got NECESSARY, POISONOUS, AND AUTOGRAPH all correct. Agatha realizes that all the spelling teams are using the same words and that Bella's school team is just a week ahead of the Odd Street School team. All she has to do is keep pretending to be James and get Bella to email her words each week and even Martha can beat Gwendoline Tutt! But it might take perhaps some, er, more affectionate closings in those emails from James. Agatha writes Bella right back requesting her new words and closes with a Love from James. She has James describe himself as handsome and muscular and even throws in some XOXOXOs. But Martha is proving to be a sorry speller even when she knows what the words will be, and the desperate plotters decide that in defeating Gwendoline Tutt, even a little more cheating is justified, Ellie volunteers to write the weekly words on her leg, under her sock, for Martha to copy. Agatha is in over her head again this time, and when Martha balks at cheating, it looks like the "Dump Gwendoline" plan is a bust, and when the real Bella, with her mom, in town to film a commercial, makes a surprise visit at Agatha's house, Agatha is sure her cover is going to blown and she'll be in deep trouble big time, in Kjartan Poskitt's forthcoming latest in her Odd Street School series, Agatha Parrot and the Heart of Mud (Houghton Mifflin Clarion, 2016). 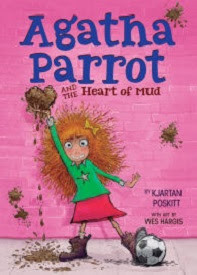 But for Agatha Parrot, it isn't over until it's over, in another zany venture into introductory chapter books for young independent readers from the spirited Agatha Parrot and her kooky friends. There's never a dull page with the ebullient Agatha on the case, and with the ample and quirky comic illustrations courtesy of Wes Hargis, every day at Odd Street School is guaranteed to be, well, odd, but a hoot. He's pretty hairy, but otherwise he's your typical boy. He lives in a dark cave like everyone else back then, sure, but the trouble with Tek is that he never comes out. In the evening an eerie glow came from Tek's cave. 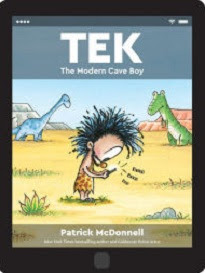 Yes, Tek is an early example of the techno-addict, devoted to his electronic devices: day and night, rain, snow, sleet, and sunny days, it's just beep, beep, bloop bloop from back there at the end of the cave. Tek's friend Larry tries to get him to come outside and play with the others. After all, it's the Ice Age and the sledding is always great! "My brain may be the size of a walnut, but I know that's not a healthy situation," Larry points out. Every one in the tribe sees that it's going to take a prehistoric disaster to get Tek, his tablet, and his game box outa that cave, and when the local volcano, Big Poppa, finally blows its top, Tek is ejected right into another epoch, in Patrick McDonnell's tongue-in-cheek looks at a stone-age technophile, Tek: The Modern Cave Boy. (Little, Brown, 2016). Since the invention of electronic media, going back to, oh, maybe Thomas Edison's first phonograph, parents have had one inevitable, perennial thing to say to their offspring--"TURN THAT THING OFF!" The Caldecott-winning Patrick McConnell pens a modern cautionary tale, poking gentle fun at the habituated "vidiot" kid hooked on electronic games and Tek's "idontgiveadactyl" attitude, ironically giving his book cover and pages the look of a tablet device. Kids may laugh and parents will shake their heads ruefully, as they agree that it may take an eruption (or hiding the charger, which will engender a different sort of eruption) to give that game boy a rest, but at least they can get a laugh out of this seemingly set-in-stone modern dilemma. Texts Booklist, "Good, snarky fun for parents and kids." ABERDEEN DIDN'T MEAN TO LEAVE THE YARD--BUT A BALLOON FLOATED BY, SO HE FOLLOWED IT. "Stay in your own backyard!" Mama had said, and Aberdeen was doing just that until that big red balloon floated by, its long string trailing irresistibly behind it. Aberdeen follows after it, burrowing messily under the fence. He runs through the neighbor's flowers, the string just above his reach, until the balloon dips low. Aberdeen's tail gets tangled in the long string as he leaps for it. ABERDEEN DIDN'T MEAN TO FLY AWAY. At first it's exciting to float over the backyards, but Aberdeen begins to worry as he drifts beyond his neighborhood, over a field and then over the woods. ABERDEEN DIDN'T MEAN TO POP THE BALLOON! But his little mouse nails are sharp, and the balloon explodes, sending him down, down, into the weeds. Now he's all turned around. Aberdeen didn't mean to wander into the woods, away from home, until suddenly he realizes that he is lost in the darkening woods, where his mama always said there are owls! ABERDEEN DIDN'T MEAN TO CRY! 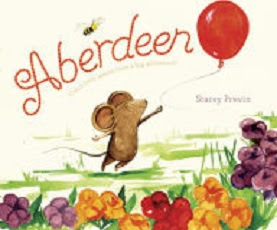 One thing just leads to another, in Stacey Previn's Aberdeen (Viking, 2016), as the involuntary little runaway takes an unexpected excursion into the wilds. All ends well, with Mama's worried calls filtering through the twilight woods to where Aberdeen is sitting forlornly, and he's all too happy to explain earnestly that he didn't mean to make Mama worry. "BUT YOU DID, SWEETIE!" MAMA SAID. Aberdeen is rightfully repentant, but as Previn makes clear in her jolly, ebullient watercolor illustrations, his adventurous balloon voyage outside the world of fenced backyards is one he won't soon forget. As Publishers Weekly points out, "... sometimes, the offer of adventure is just too good to pass up." What's NEAT? A baked potato! What's MESSY? A baked potato sitting on a squished frosted cupcake! What's QUIET? A French fry reading a book. What's NOISY? A can of baked beans blowing a trombone! What's COLD? An ice cream cone, of course. But what's HOT? A bowl of alphabet soup. If a crisp pretzel is HARD, what is SOFT? A melty chocolate bar, of course. These things are obviously OPPOSITES! But what's UP and DOWN at the same time? Ah! Easy Peas-y! A seesaw with a peanut person UP and a toast-and-jelly person down. But is a peanut butter sandwich the opposite of a jelly sandwich? If not, what are they? 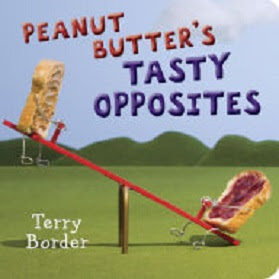 Terry Border's new board book for preschoolers, Peanut Butter's Tasty Opposites, takes on the nebulous subject of opposites, a non-concrete concept, in which the differences are, well, all relative. Author-illustrator Border pulls out his peanut people, first seen in his 2014 picture book, Peanut Butter and Cupcake in a second concept book for preschoolers that takes on the idea of ways things can be opposites. Border's artistic style is a truly tongue-in-cheek, with all tastebuds engaged, in his photographically-rendered Peanut, Jelly Sandwich, Cupcake, and French Fries with little twisted metal legs, demonstrating the concepts in his companion board book to Peanut Butter's Yummy Numbers: Ten Little Peanuts Jumping on the Bread! Other foody, funny, and punny books by Terry Board are Happy Birthday, Cupcake! and his back-to-school hit, Milk Goes to School. Are you reading this, Terry Border? How about taking it up a notch and letting your food group take on the grammatical category of Positives, Comparitives, and Superlatives--as in loud, louder, loudist or peanutty, peanuttier, and peanuty-ist! 10 LITTLE PEANUTS JUMPING ON THE BREAD. Finish that rhyme in four words or less! 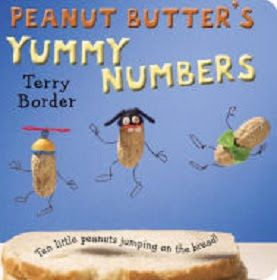 Yes, Terry Border's latest spin-off of his hit, Peanut Butter and Jelly: A Play Rhyme, parodies the popular countdown song about five little monkeys and a bed, using the author-illustrator's cutesy little peanuts taking their licks as each leaps one by one on the forbidden bread and land on its head. With this bouncy meter and repeated rhyme, kids will crave to join the countdown, learning their numbers as they sing along. This time it's not Mama who steps in, but The Baker, who takes charge as his slice of bread gets flatter and sadder and the peanuts' boo boos add up, until it's back to the old oven to bake some more, in Border's latest board book for preschoolers, Peanut Butter's Yummy Numbers: Ten Little Peanuts Jumping on the Bread! (Philomel Books, 2016). There's plenty of punning and funning in store for youngsters until they are ready for arithmetical liftoff with the numbers from one to ten, along with Border's jolly peanut people artfully set in spot-art style against their bright-white pages. Perhaps pair this one with the Eileen Christelow's beloved classical version, read first, Five Little Monkeys Jumping on the Bed (A Five Little Monkeys Story), to set the stage for a comparison lesson (What's the same, and what is different?) with twice the counting practice along with double the barrel-of-monkeys snickers. IF YOU WANT A PET TRUCK--AND WHO DOESN'T?--YOU HAVE COME TO THE RIGHT PERSON. I THINK EVERYONE SHOULD HAVE ONE, AND THAT IS WHY I WROTE THIS BOOK. In his new companion book to his popular How to Train a Train (reviewed here), author Jason Eaton pens a manual for the kid who wants a pet truck. Trains stay on their tracks, so they are easy to find and keep, but trucks are a different story. Trucks can be found wherever roads go, and many are even to be found off-road in the wilds, so before a kid adopts a truck, he's got to track down the perfect one. But the author has some apt advice for the novice truck fancier. First the potential truck owner needs to understand the natural habitats of trucks. DO YOU WANT A MOVING TRUCK? THEY LIVE IN BUSY NEIGHBORHOODS. A MONSTER TRUCK? THEY LURK IN ABANDONED PARKING LOTS. The author points out that some delightful and desirable trucks may be migratory. Ice cream trucks head south in the winter, while snowplow trucks head north and are easily tracked down in wintry climes. And then the truck owner has to consider the proper breed of pet truck to fit his lifestyle. IF YOU LIVE IN A SMALL APARTMENT, A CAR TRANSPORT TRUCK MAY NOT BE A WISE CHOICE. And as for the actual capture of your chosen truck, you may need to learn how to recognize your truck's tire tracks and follow him to his lair. Sometimes you may EVEN have to lead them into your trap. But there's a perfect lure for the wily truck. TRUCKS CAN'T HELP FOLLOWING A TRAIL OF ORANGE CONES. And once you have your perfect pet truck in sight, remember you can conveniently attract it with the universal homing call of the truck. MAKE A FIST AND PULL IT DOWN TWICE! And the perspective owner will be rewarded with that characteristic call of the truck, "HONK!" 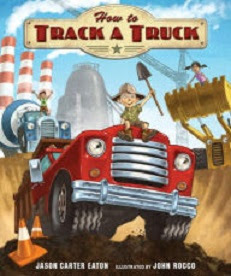 in Jason Carter Eaton's latest, How to Track a Truck (Candlewick Press, 2016), in a comic treatise on truck-keeping that benefits hugely from noted artist John Rocco's bold and bright multi-perspective illustrations of all sorts of trucks and all sorts of kids successfully on safari to park trucks in their own homes. Each truck comes across with its own personality, yet all come together to cooperate in all sorts of truck-ish activities. As author Eaton promises, "You'll be good to GO!" And that is just what kid truck lovers love to hear. HATCHING TWO EGGS--REXY AND HER BROTHER. 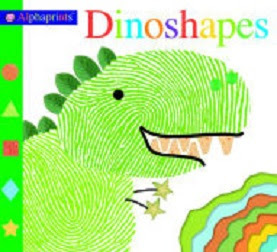 In Roger Priddy's newest in his Alphaprints series, Alphaprints: Dinoshapes (Priddy Books/St. Martin's Press, 2016) Priddy gives us a different way to see Tyrannosaurus Rex, That traditional reptilian bad guy is seen as a proud mother of twins. Other dinosaurs appear in short order. Baronyx, Diplodicus, Tricerotops, Ankylosaurus, and Pterodactyl also make cameo appearances, all represented in raised fingerprint shapes, the tactile star of their own two-page spreads in bright colors, with pronunciation guides, each one doing his own thing, from eating starfish to playing soccer. In this colorful board book, Priddy even offers a bit of dino humor, with a succession of big beast bites taken right out of the cover and each page,providing a thumb-index to each dino. It's a fun way to introduce the most popular dinosaurs to preschoolers who dote on the big critters. "WHAT ARE YOU MAKING, MR. PANDA?" Panda is stirring up something intriguing in his big mixing bowl, but Alpaca has no patience with the wait for goodies. He's out of there. But his place is soon taken by Anteater, asking the same question. "WAIT AND SEE!" SAYS PANDA. But Anteater is too antsy to wait around. In turn, White Rabbit and his bunny buddies show up pester Mr. Panda, and when they decline waiting and decamp, Crane lands to eyeball the bowl to see if anything promising is forthcoming. But when told it isn't, he flies the coop, too. Only Little Penguin has the patience to persevere until the product of the baking comes out of the oven, and he's the only one to get the spoils of his patience--a delish and devilishly splendid giant doughnut with sprinkles! 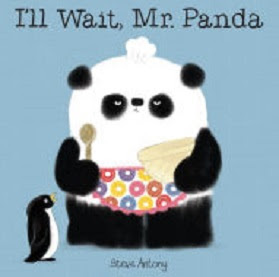 A procession of black and white critters pass up the rewards of patience in Steve Anthony's I'll Wait, Mr. Panda (Scholastic Press, 2016), an eye-pleasing paean to the old proverb the "All things come to those who wait." The companion book to Anthony's wise and wry little parable, Please, Mr. Panda, this timely tribute to the virtue of patience for preschoolers goes down easy and doesn't belabor its premise, with a gentle example (patient Little Penguin gets to choose the glaze and the topping and says his proper thank you, too), with delightfully and tidily stylized illustrations that youngsters will love. Pair this little lesson in good manners persuasively with Steve Anthony's first book here. A little one in the house is a joy during the holiday season, a gift we have given ourselves. But what to put in the little one's stocking? Sandra Magsamen's latest offering, Our Little Deer (Earesistables) (Scholastic Press, 2016), is great for the youngest ones in the house, a book which sparkles like the Christmas lights that this little deer gets tangled in his antlers, as it introduces wordplay between the words "dear" and "deer." 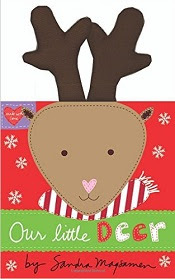 There are plenty of endearments for the little one, as Mom and Dad share loving thoughts and wishes for a merry holiday season, and the plushy, three-dimensional antlers, which will no doubt serve as handles, make this little board book a cuddly, snuggly, lovey little lapsit holiday gift to share. When Kristoff from Frozen, needs a real friend, one who is strong and can be counted on, who's he gonna call? There are lots of candidates. Anna is funny and faithful. Elsa has magic which can make it snow. And Olaf, the silly snowman, is surely sweet, from his orange nose down to his snowy feet. Reindeer are better, and the best is Sven! 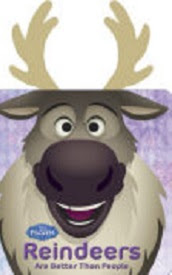 Just right for the coming Yuletide is Disney's board book for the youngest Frozen fans featuring Sven the Reindeer, complete with felt antlers well stuffed with fluff, for topping off stockings with some plush punch, in Frozen Reindeers are Better than People (Disney Frozen) (Disney Enterprises, 2015). Perfect for the preschool set, pair this one with Disney's Olaf's 1-2-3 (Disney Frozen) (Glitter Board Book) for a Frozen fest! From the moment his sister arrives... the Boss Baby had a feeling change was in the air. Boss Baby has ruled the executive suite for a long time. His dark power onesie and skinny tie show he's all business, but suddenly it seems his staff (Mom and Dad) have conspired to carry out a hostile takeover, in the form of a new baby sister. In her no-nonsense black onesie and baby-safe pearls, she's swiftly moving into the corner office. "... from the top down!" And her ride is the Cadillac of exec baby carriages. There's no doubt that Bossy Baby has been demoted, kicked downstairs by a baby sister, who is clearly the Bossier Baby. He's definitely a disgruntled employee and opts for a bit of industrial sabotage. He slips out his professional onesie in public, but Mom doesn't give him a glance. He pees into the park flowers, but Dad doesn't notice. ...the CEO and staff paid no attention to him. No matter what he did! The Boss Baby has clearly been terminated, forced into early retirement. He tosses his briefcase down and rips off his green eyeshade. He goes to his room and crouches in a corner for a good cry. The Bossier Baby crawls into his room, and when the old Baby turns around, she gives him the universal and irresistible "pick-me-up" gesture. 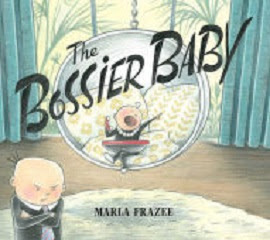 Savvy in handling restiveness in the ranks, this CEO knows how to handle her human resources, and in the Caldecott-winning Marla Frazee's clever follow-up to her hit, The Boss Baby (Classic Board Books), her just published The Bossier Baby (Beach Lane Books, 2016) will have the gross sales chart heading on up. Frazee's cleverly comic 1950s-retro setting is perfect for this spoof of both corporate takeovers and the newborn blues, a dandy pairing with her first book for a mock-sophisticated look at the new baby syndrome. Along with its clever premise, Frazee's prize-winning artwork finds its metier in her stylized and stylish gouache and pencil illustrations for this book. "Someone give Frazee a raise!" says Kirkus in a starred review.